The Achieving a Better Life Experience (ABLE) Act of 2009 (S 493/HR 1205) would give individuals with disabilities and their families the ability to save for their child’s future just like every other American family, and help people with disabilities live full, productive lives in their communities. If your Senator is a member of the Senate Finance Committee, please contact your Senator immediately. DSAOC has received a grant from the Disney VoluntEARS Community Fund! This initiative provides grants to not-for-profit organizations that demonstrate new and innovative approaches to addressing challenges in our community. To date, more than $5 million has been granted to local not-for-profit organizations on behalf of the Disneyland® Resort Cast. The $5000 received will be used to fund the Hospital Outreach program. DSAOC’s Hospital Outreach program ensures our local labor & delivery hospitals and clinics have up-to-date information on Down syndrome, as well as information about DSAOC so they know to contact us when a baby with Down syndrome is born in their hospital. Hospital Outreach volunteers visit with our local hospitals, providing them with information on Down syndrome, DSAOC and information for doctors on how to better deliver the diagnosis to expectant parents. DSAOC was nominated by cast member Nancy Tovaas, who got to know our own Sarah Jensen through the Yorba Linda Cloverleaf 4H group. Sarah and Nancy are shown together with the check. Very special thanks to Nancy and all at Disney! Our friends at DSALA shared with us an announcement from Congresswoman Cathy McMorris Rodgers from Washington State. 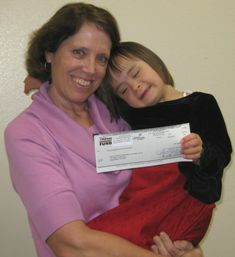 She is an amazing advocate on Capitol Hill for Down syndrome and recently co-sponsored resolution, H.Res. 1576, which passed the House last week. This resolution would establish a National Day of Recognition for Parents of Special Needs Children. She joined with 41 of her colleagues in a bipartisan way to highlight the importance of recognizing parents of special needs children. Congresswoman Cathy McMorris Rodgers has a young son with Down syndrome. She is a leader in the Congressional Down Syndrome Caucus. You can follow her work by visiting her website and signing up for her e-mail alerts. Back in August we shared news with you about the Glennwood Housing Foundation’s efforts to bring a housing community to Laguna for 45-50 young adults with developmental disabilities. This housing community has come to fruition and they are having an Open House this Saturday, December 4 from noon to 3:30 p.m. If you have an interest in having your son or daughter live at this housing facility, you should definitely go to this event.